It’s Friday, and at The Junction Neighbourhood Centre we’re feeling happy because the wonderful Kevin, our volunteer Justice of the Peace, is offering his regular Friday morning service at our Maroubra office. He’s in his third year of acting as JP here, and also works regularly at Lionel Bowen Library in Maroubra and iat South East Neighbourhood Connect in Eastlakes. “Happy” is the theme of the day when Kevin’s in. 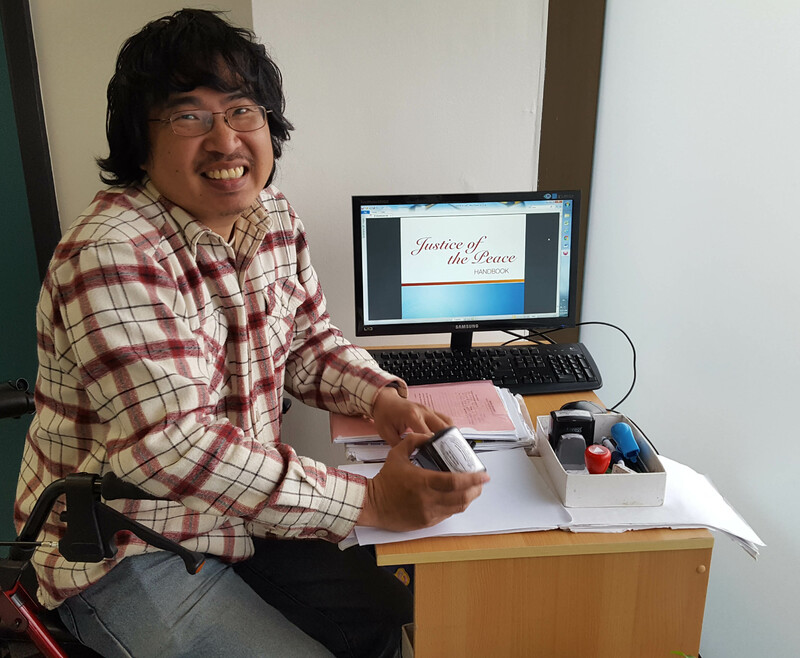 As he says, “I never stop smiling.” Kevin enjoys his work “because I can help people”. Kevin’s JP services run from 10am-12.30pm every Friday at Shop 2, 669-673 Anzac Parade Maroubra. At The Junction Neighbourhood Centre we also offer a number of other services to support the community. Have you made an appointment to get help with preparing your tax, at our Maroubra, Glebe or Bondi Junction centres? This free service runs till the end of October. Call 9349 8200. We also offer one-on-one computer tutoring services for people aged 55+, resumé help and activities to support people who want to keep active and make connections across the community. Try our Garden Walk and Talk in Bondi Junction on Mondays, our walking group in Maroubra on Tuesdays, our Board Games Group in Maroubra on Thursdays – and more. Phone 92349 8200 to enquire or book. See our Monthly Calendar for more details. Mental Health & Wellbeing for Older People, a talk on maintaining wellbeing as you age, an interactive game, and morning tea. This event is free. Come along at 10am. Phone 9349 8200.